Honda vehicles require specific Bohler X96 welding wire when MAG welding high strength and ultra high strength steel (590MPA-1500MPA). Honda also requires the use of specific MAG welders that meet minimum voltage requirements outlined by Honda engineers. 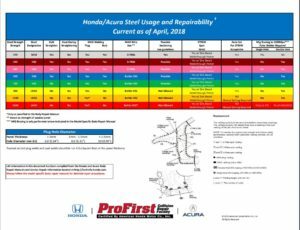 Furthermore, Honda requires the use of only 3M 7333 two part adhesive during certain repairs such as the replacement of the 2018 Honda Accord quarter panel. As a Honda Acura ProFirst Shop we have the access and knowledge to make sure your Honda or Acura is repaired as the OEM intended. Your insurance company does not care how your vehicle is repaired and it is up to the consumer to make sure their vehicle is repaired by the proper professionals.